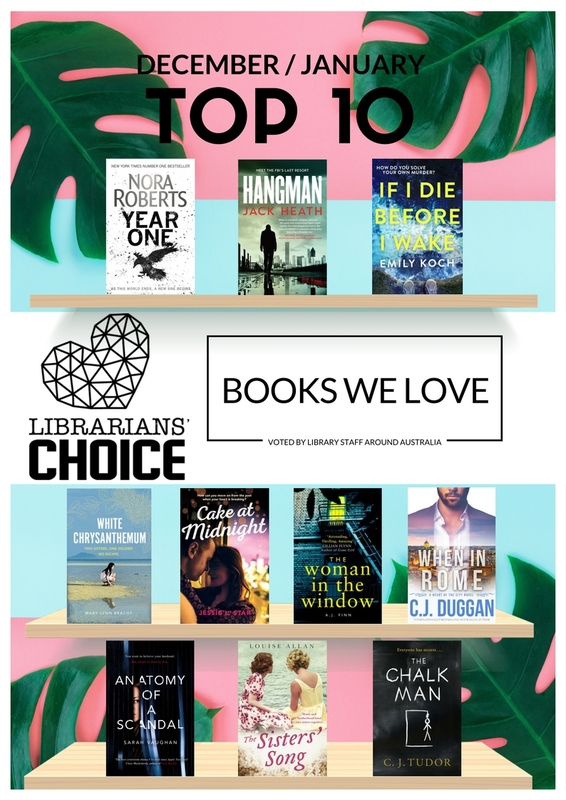 The Top 10 New Reads for December 2017 and January 2018 as voted for by Australian Library Staff – why not reserve your copy now? Meet Timothy Blake, codename ‘Hangman’. Blake is a genius, known for solving impossible cases. He’s also a psychopath with a dark secret, and the FBI’s last resort. A 14-year-old boy vanishes on his way home from school. His frantic mother receives a terrifying ransom call. It’s only hours before the deadline, and the police have no leads. Everyone believes Alex is in a coma, unlikely to ever wake up. As his family debate withdrawing life support, and his friends talk about how his girlfriend Bea needs to move on, he can only listen. But Alex soon begins to suspect that the accident that put him here wasn’t really an accident. Even worse, the perpetrator is still out there and Alex is not the only one in danger. As he goes over a series of clues from his past, Alex must use his remaining senses to solve the mystery of who tried to kill him, and try to protect those he loves, before they decide to let him go. Hana and her little sister Emi are part of an island community of haenyeo, women who make their living from diving deep into the sea off the southernmost tip of Korea. One day Hana sees a Japanese soldier heading for where Emi is guarding the day’s catch on the beach. Her mother has told her again and again never to be caught alone with one. Terrified for her sister, Hana swims as hard as she can for the shore. So begins the story of two sisters suddenly and violently separated by war. Giovanna, Zoë and Declan have always been a trio – their fierce friendship has seen them through every heartbreak and hardship and helped pave the way to brighter futures. Gio is a passionate baker of cakes, pastries and all things delicious, Zoë a take-no-prisoners beauty, and Declan an ambitious businessman on the way up. Best friends forever, Gio thinks – until her lifelong crush on Declan is exposed, leaving her humiliated. Gio realises she needs to cut him loose to get over him once and for all. Enter Theo, Gio’s neighbour . . . She’s never met anyone like him before. It’s been ten months since Anna last left her home. Her lifeline to the real world is her window, where she sits day after day, watching her neighbours. When the Russells move in, Anna is instantly drawn to them. But one evening, a frenzied scream rips across the silence, and Anna witnesses something no one was supposed to see. Anatomy of a Scandal centres on a high-profile marriage that begins to unravel when the husband is accused of a terrible crime. Sophie is sure her husband is innocent and desperately hopes to protect her family from the lies which might ruin them. Kate is the barrister who will prosecute the case she is equally certain that James is guilty. Set in rural Tasmania from the 1920s to the 1990s, The Sisters’ Song traces the lives of two very different sisters. One for whom giving and loving are her most natural qualities and the other who cannot forgive and forget. As children, Ida loves looking after her younger sister, Nora, but when their beloved father dies in 1926, everything changes. The two young girls move in with their grandmother who is particularly encouraging of Nora’s musical talent. Nora eventually follows her dream of a brilliant musical career, while Ida takes a job as a nanny and their lives become quite separate. This entry was posted in Fiction, New Arrivals, Recommended Reading by Parra Reader. Bookmark the permalink.